Another Sunday Favorite with Chari at Happy to Design. Click on pic above to see other favorites! I remember Sunday lunches when I was growing up fondly. When we got home from church we would set the table with the good china and all gather round the table. Often, we would have company and spend 2 or 3 hours at the table visiting. I remember one occasion when my mother had put a roast in the oven before church. When we got home, she had a migraine headache so we were going to just have a low key lunch so she could rest. As it happened, there was a mix up in dates and one of the ministers from the church and his wife thought they were invited for lunch that Sunday and, of course, showed up ready to eat. My poor mother, got us to set the table and she went ahead and presented a lovely meal with a smile (even though she felt terrible). Place a 3 to 5 lb. roast in a roasting pan and season with salt and pepper. Mix together cream of mushroom soup, 1 pkg. of Campbell’s beefy onion soup mix and a can of beef consumme. Pour over roast. Put roast in 325 degree F. oven and roast for 2 to 3 hours. Place potatoes that have been quartered or cut into 8ths and carrot chunks into pan around the roast after the roast has cooked for 2 hours or so. Raise oven temperature to 35o degrees F. and cook for an additional 30 to 40 minutes until vegetables are soft. Remove roast and vegetables from pan and make a gravy with the pan drippings. Serve roast and vegetables with hot rolls, a green vegetable and a smile. My friend, your Sunday dinner post brought back so many fond memories to me of when I was growing up and also when my children were at home! We always “did it up right” for Sunday dinner or should I say lunch? Hehe! It was one day of the week that we definitely could count on for “family time”! I’m so afraid that this is a tradtion that is quickly becoming a thing of the past…and it’s so sad! 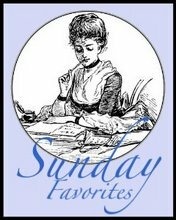 Thank you so much for sharing the story of your Sunday family dinners and joining in with Sunday Favorites this week, my friend!!! Oh yes…your mama’s roast recipe sounds scrumptious…I’m going to give it a try! I have always slow cooked my roasts on top of the stove (my mama’s recipe…hehe!) I’ve never tried it with the cream of mushroom, onion, and consomme soup base…sounds really good! PS…so sorry that I’m late in getting over. We had our big family estate sale this weekend and I was soooo busy! I remember those same Sunday dinners… and often wonder “what happened to them?” Families live further apart now… and dont’ get together that often.. Wonderful post.. especially Mom’s Roast!